Do you live in Massachusetts or Connecticut, and shop at Big Y markets? Great news! Beginning this week, your weekly dinners can be healthier, easier to make and more affordable! 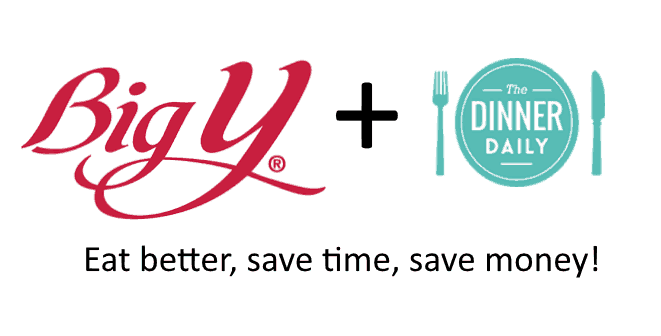 Sign up for The Dinner Daily and indicate Big Y as your market, and each week you’ll receive a plan for five delicious and easy dinners, a shopping list, and links to coupons, and your menu will be built around what’s on sale at Big Y that week- you will definitely save money at Big Y using our service; many of subscribers save 20% or more on their weekly food budget. If you don’t find your store when you sign up – just select our ANY STORE option. Your weekly menu won’t be based on weekly sales, but you’ll still eat better, save time and save money with the coupons. We’ll be adding more stores and covering more locations across the country over the coming months, so stay tuned for more announcements.